Interference fits are used extensively in aircraft structural joints because of their improved fatigue performance. Recent advances in analysis of these joints have increased understanding of the nonlinear load-contact and load-interfacial slip variations in these joints. Experimental work in these problems is lacking due to difficulties in determining partial contact and partial slip along the pin-hole interface. 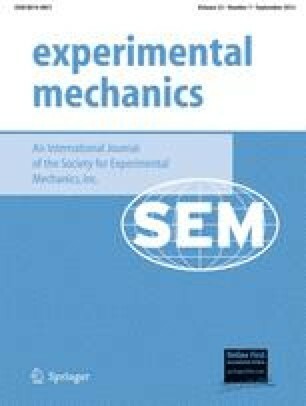 In this paper, an experimental procedure is enumerated for determining load-contact relations in interference/clearance fits, using photoelastic models and applying a technique for detecting progress of separation/contact up to predetermined locations. The study incorporates a detailed procedure for model making, controlling interference, locating break of contact up to known locations around the interface, estimating optically the degree of interference, determining interfacial friction and evaluating stresses in the sheet. Experiments, simulating joints in large sheets, were carried out under both pin and plate loads. The present studies provide load-separation behavior in interference joint with finite interfacial friction. also, Assistant Professor, R.E. College, Durgapur, West Bengal, on deputation.